Dieter Rams is the undisputed granddaddy of modern industrial design. The German legend's ten commandments for good design are considered gospel in the field, and his impeccable collections for Braun elevated home appliances to mass-produced art. Systems, at Walter Knoll in London, is a new exhibition paying two-dimensional tribute to the man and his work. For the show, the steadfast Rams aficionados at online shop das programm curated a collection of new posters from some of today's biggest studios and creative talents. 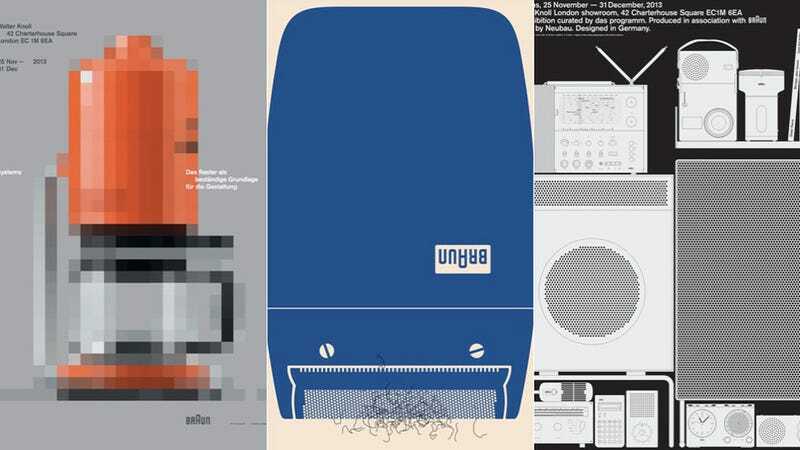 Given the loose brief—"a response to Braun Design"—it's interesting to check out the similarities that run through the entries, as well as their fun takes on functionalism, making each unique. Clean lines and ultra-minimalism are understandably present and correct across the board, but for me, the ones that break form are the most powerful. L2 M3 and Tom Higston's playfully hint at the day-to-day use of these day-to-day objects with the addition of a tuft of stray hair on a razor or gooey drips on an electric mixer. These icons can be put on display at museum exhibitions dedicated to their enduring influence, but they can also be put in a bathroom or kitchen cabinet. Ultimately, Rams imagined items that were built to be used and enjoyed.